"All their joints turning together. Moving together. Towards you." 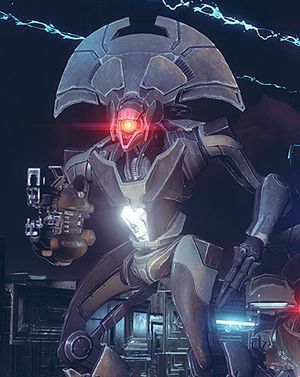 The Goblin is the basic unit within the Vex Nexus. Even when the Goblin is dead you can still shoot the head off of its body. Nessus-based Goblins have a slightly more intricate chassis with a more curved head design. An in-game screenshot of a Goblin. A Guardian fighting a horde of Vex Goblins.